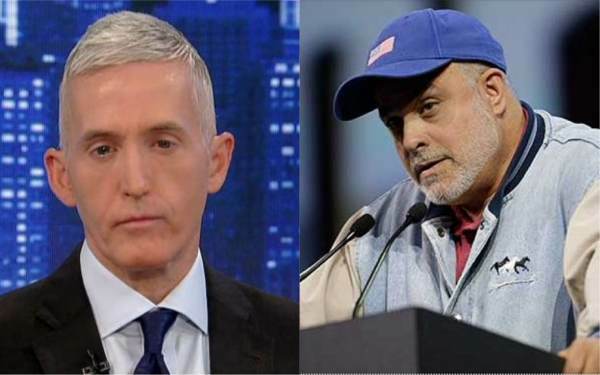 Conservative talk radio host Mark Levin blasted “slip and fall lawyer” Rep. Trey Gowdy, R-S.C., Wednesday over the lawmaker’s claims that the FBI did the right thing by planting a spy in the Trump campaign. Levin, the former chief of staff to Attorney General Ed Meese, dismantled the congressman’s Spygate apologetics point by point. On his media tour defending the FBI insists the Russia probe and the FBI’s surveillance of the Trump campaign was never about targeting Trump, but was merely to investigate Russia and Russian infiltration. “Chris Wray and Rod Rosenstein have made it clear to us, Donald Trump was never the target of the investigation, he’s not the current target of the investigation. Keep in mind, that could all change depending on what a witness says. But as of now, Chris Wray and Rod Rosenstein are stunned whenever people think that Trump is the target of their investigation. I’ll leave it to them how to brief the president,” the South Carolina congressman told Fox News’ Martha MacCallum Tuesday. Levin slammed Gowdy’s assessment, arguing that counter intelligence agencies would have assigned informants to the Clinton campaign and DNC after they claimed the Russians hacked their server. Contrary to Gowdy’s assertion, Levin argued, the entire purpose of the FBI”s spying on Trump and the ongoing Russia probe is to frame the president. Gowdy told CBS News that he had seen no evidence to support Trump’s claims that a “spy” was improperly inserted into his 2016 campaign.